One of the wealthiest young men in Hartford, Samuel Clemens had a house designed by Edward Tuckerman Potter, and lived here for 17 years. Samuel Clemens ("Mark Twain," 1835-1910), the famous American author from Hannibal, Missouri settled in Hartford, Connecticut in the early 1870s. His grand house at Nook Farm, 351 Farmington Avenue (map), was finished in 1874 at a cost of $131,000, and is extremely rich in the sort of detail that makes Victorian architecture so much fun to inspect. Twain moved out of the house only after bad investments forced him to take a lecture tour of Europe for some quick money. He loved this place for the best years of his life, and wrote Tom Sawyer, Huckleberry Finn, Life on the Mississippi, The Prince and the Pauper, and A Connecticut Yankee in King Arthur's Court while he lived here. To see the Mark Twain House you must take the tour, which is just as well, for the guides have an encyclopedic knowledge of the house and its occupants. Right next door, also at Nook Farm, is the Harriet Beecher Stowe House. 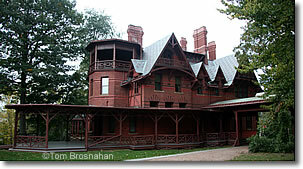 Mark Twain's House at Nook Farm in Hartford CT.